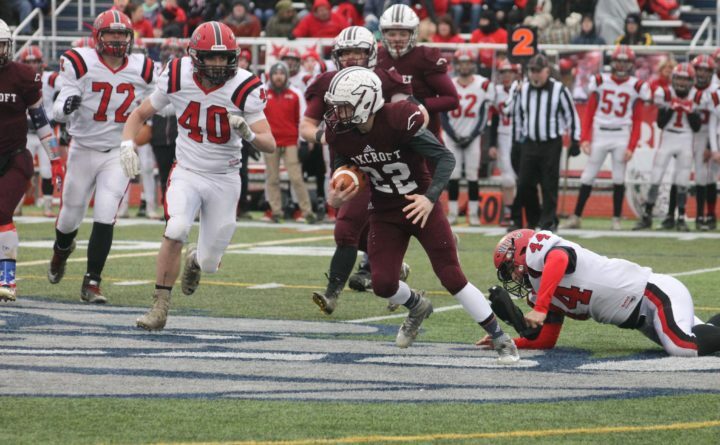 Michaleb Niles of Foxcroft Academy slips a tackle by Matt Tufts (right) of Wells as the Warriors' Ethan Marsh (40) and Morgan Welch-Thompson (22) pursue in this 2017 file photo. Game notes: Bangor seeks to build on its first win since the 2015 playoffs in its second straight home game. Coach Dave Morris’ club featured the rushing of senior Gabe Higgins and sophomore James Neel during its 14-0 victory over Windham as they combined for more than 200 yards. Bangor’s defense has not allowed a point in its last six quarters. Deering has experienced a rapid descent in the Class South A ranks, from 6-3 in 2015 to 1-8 last year. The Rams are 0-2 this fall with losses to defending state champion Scarborough and perennial contender Thornton Academy of Saco by a combined 116-7. Longtime Portland-area assistant coach Rob Susi is the Rams’ first-year head coach, the program’s fifth since 2010. Deering’s lone points came on an 84-yard pass from sophomore quarterback James Opio to senior wideout Wenston Dinizio in a 46-7 Week 2 loss to Scarborough. Game notes: Hermon is the lone surviving undefeated team in Class C North and coach Kyle Gallant’s Hawks seek their second straight 3-0 start to a season. Hermon has been strong on both sides of the line of scrimmage, outscoring John Bapst of Bangor and Morse of Bath by a combined 74-12. Nokomis continues its rugged early schedule, rebounding from a Week 1 loss to Winslow with a 31-20 victory at Oceanside of Rockland. Senior quarterback Andrew Haining passed for 158 yards and two TDs to classmate Brock Graves, while Quinton Richards added a 14-yard scoring run. Game notes: With four winless teams in the Class B North standings and only two of the four likely to qualify for postseason play, this could be a key crossroads contest. Brewer has played a rugged schedule, falling late in its home opener against Biddeford and then spotting Class B South finalist Falmouth a 20-0 lead last week before losing 27-15 on the road. Lawrence has absorbed a surprising loss at Mt. Blue of Farmington in Week 1 that was followed by a 49-13 defeat at defending Class B state champion Marshwood of South Berwick. The Bulldogs hope to utilize the home-field advantage in the hopes of getting their season on track. MATTANAWCOOK ACAD. vs. FOXCROFT ACAD. Game notes: Two of the four undefeated teams in LTC Class D North square off with a share of the league lead at stake. Neither team has been tested, with defending league champion Foxcroft averaging averaging 60.5 points in victories over Mount View of Thorndike and Houlton — including an average of 51 points in the first half. The Ponies have displayed a productive passing game with quarterback Matt Spooner completing 17 of 25 passes for 309 yards and seven TDs, while sophomore Logan Martin has eight catches for 178 yards and five TDs. Senior Hyatt Smith is averaging 18.0 yards per catch. Game notes: Bucksport has outscored Houlton and Stearns of Millinocket by a combined 117-6 en route to its first 2-0 start since 2013, when the Golden Bucks won their last regional title. Coach Joel Sankey’s team features a top backfield tandem in Carter Tolmasoff and Lucas Wardwell. Bucksport defeated Dexter 47-8 a year ago to end a two-game losing streak to the Tigers, who have allowed just one TD in victories over Ellsworth-Sumner and Washington Academy of East Machias. Nose tackle David Kirshkain is one key to defensive success for coach Andrew Shorey’s Tigers.